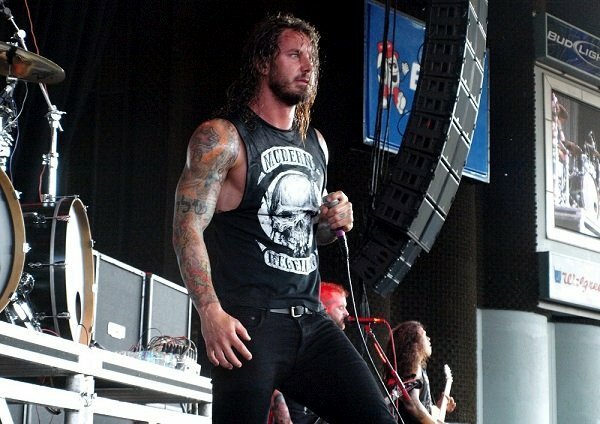 Shocking news in the metal world today, as FOX 5 San Diego and Reuters are both reporting that singer Tim Lambesis, 32, of San Diego metal band As I Lay Dying was arrested for allegedly soliciting an undercover detective to murder his estranged wife. According to the San Diego Sheriff’s Department, Lambesis was taken into custody on Tuesday (May 7) around 2 p.m. He was charged with solicitation of another to commit murder of his wife, who lives in Encinitas. Police started investigating Lambesis in the instance on Thursday (May 2), when they got information that he allegedly was trying to get someone to commit the murder. That’s the same day the musician apparently contacted an undercover detective with a plot to kill his wife, deputies are reporting. He was booked into the Vista Detention Facility on suspicion of solicitation of murder. As I Lay Dying have released six studio albums over the past 12 years and played some of the biggest metal festivals in the world, including Ozzfest and Mayhem Festival. The band was on target to start a U.S. tour this month. Photo: Tim Lambesis via Audio Ink Radio.